Merry Christmas from the Beacon Hill Blog. 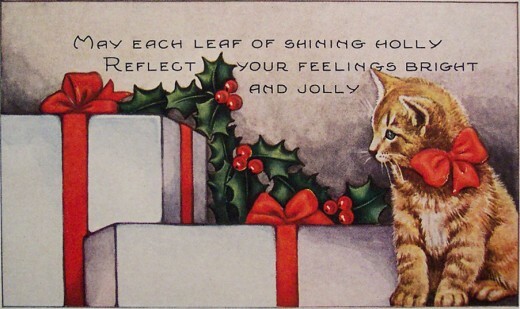 Vintage postcard image provided by riptheskull via Creative Commons/Flickr. We wish you the merriest of Christmases from the Beacon Hill Blog! We’ve had a bit of an unplanned break here at the BHB for the last few days. But fear not — the blog is still here, and more posts are coming. Please stay warm and cozy today — there is a slight possibility of snow, though it’s likely to be too warm. Seattle snow forecasts are often flaky (see what I did there? ), because it’s difficult to predict snow in our climate, but even without the white stuff, it will be chilly. Happy Holidays to all Beaconians and friends! El Día de la Vírgen de Guadalupe y Las Posadas, with holiday music, food, and the annual tree-lighting ceremony. All are invited and welcome, and the event is free for the whole family. The event starts at 5:00 p.m. at nearby culinary establishments The Station, Travelers Thali House, and El Sabroso, who will serve hot holiday beverages such as cider, chocolate Mexicano, and Champurrado to enjoy. The Station will also have piñatas made by the Jefferson Community Center Teen Program. Inay’s and Baja Bistro will have samples of food including Filipino pastries and chicken soup. The restaurants will also feature performances by the Seattle Fandango Project and A La Carte. See a map of all the neighborhood events here. From 5:30 until 7:30, El Centro opens up with their own selection of free holiday food, a nativity scene, Las Posadas, and a visit from Santa Claus. Starting at 7 p.m., The Station will remain open for the monthly Beacon Bards poetry event. The Las Posadas event is sponsored by El Centro de la Raza and ROCKiT Community Arts with support from Beacon Hill Merchants’ Association, Verity Credit Union, Sysco, and El Quetzal. 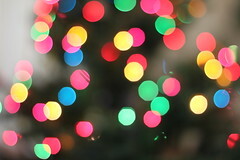 Christmas lights, by Brendan C via Creative Commons/Flickr. The second annual Las Posadas and Tree Lighting event will take place on Wednesday, December 12, sponsored by El Centro de la Raza and Beacon Hill Merchants. Everyone in the community is invited to this free holiday family celebration, with music, free food, dancing, and the annual lighting of the Christmas Tree. There will also be a visit from Santa Claus. The event begins at 6 p.m. at El Centro de la Raza, 2524 16th Ave. S.
Come early at 5 p.m. for piñatas at The Station coffee shop, across the street at 2533 16th Ave. S. The Station will also host this month’s Beacon Bards poetry reading at 7 p.m. that same evening, with poets Kary Wayson and Melanie Noel. Photo by Steven Depolo via Creative Commons/Flickr. We know, it’s not quite Thanksgiving yet, but Christmas is coming soon, and El Centro de la Raza wants to supply your Christmas greenery. The tree sale will help raise funds to support El Centro’s services for low-income families. If you pre-order your tree or wreath by today, you will receive a discount. (See the price list here.) 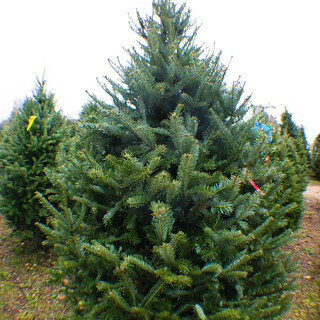 You can then come to the tree lot and pick a tree on any day you choose to. The lot is located on El Centro de la Raza’s south side, 2524 16th Ave. S. It will be open starting at noon on Friday, November 23 through Christmas Eve. Open hours will be 4-8 p.m. on weekdays and noon-8 p.m. on weekends. To order by phone or for more information, call 206-957-4605 or email execasst@elcentrodelaraza.org. 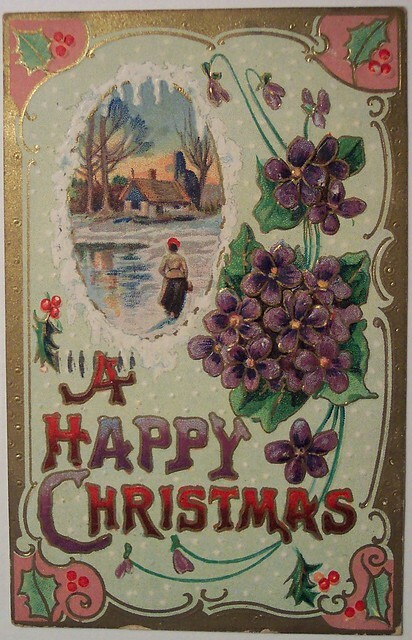 We hope all Beacon Hill Blog readers had a lovely Christmas and are having a lovely Boxing Day today. However, that lovely Christmas morning was also a stormy one, and we knowthat a few of you have had to deal with damage from the storm. 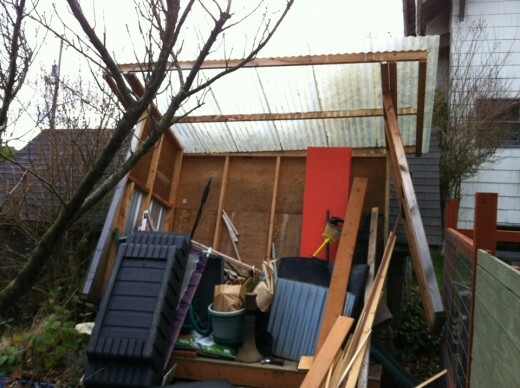 Did you have any damage from the Christmas morning winds? Please tell us in the comments. Christmas morning winds took this shed right off its base. Photo by Brook Ellingwood. Merry Christmas from the Beacon Hill Blog! As reported earlier, tonight at 6 p.m. is the free Las Posadas event at El Centro de la Raza. The event will include a Christmas tree lighting, free holiday food, $5 photos with Santa, and performances by the Seattle Fandango Project, the Beaconettes, the Danza de Negritos Troupe, and A La Carte. Additionally, ROCKiT Space volunteers have been working hard putting the finishing touches on a fleet of 45 community art chairs. 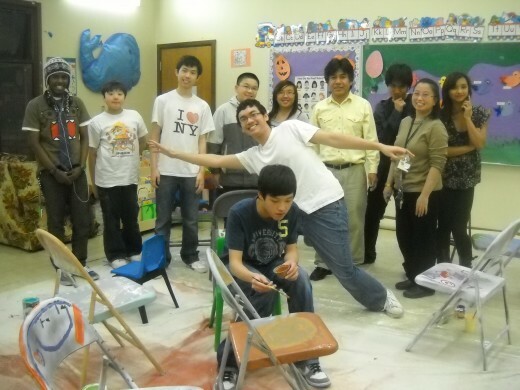 Volunteers have been working on “artifying” these chairs for a few months. The chairs will be gifted to the community tonight and used at the Las Posadas event. El Centro de la Raza is located at 2524 16th Ave. S. For more information about Las Posadas, call 206-957-4605. Chair-painting workshop participants at Jefferson Community Center worked along with artist Fulgencio Lazo to decorate the ROCKiT Space art chairs. L to R in back: Jaffer, Jia, Franklin, Peter, Emily, Fulgencio Lazo, Raymond, Jean Lee of the Jefferson Community Center Teen Program, Julie; arms outstretched: Chattdy; foreground: Vu. Photo by Sheba Burney-Jones. All are invited to El Centro de la Raza’s free Las Posadas celebration on Monday, December 12, at 6 p.m. The event will include Las Posadas led by the children and teachers of El Centro, but that’s not all. There will also be a Christmas tree lighting, free holiday food, $5 photos with Santa, and performances by the Seattle Fandango Project, the Beaconettes, the Danza de Negritos Troupe, and A La Carte. Earlier in the afternoon, Seattle Fandango Project will host a free La Rama workshop from 4 to 6 p.m.
El Centro de la Raza is located at 2524 16th Ave. S. For more information about the event, call 206-957-4605. 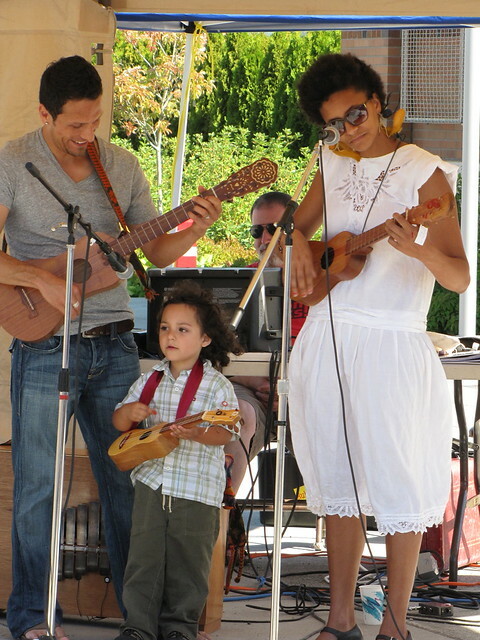 The Seattle Fandango project, shown here at last summer's Beacon Rocks!, will perform at El Centro de la Raza's Las Posadas event on December 12. Photo by Wendi. Our very own Beaconettes are competing tonight in the Great Figgy Pudding Street-Corner Caroling Competition, at Sixth and Pine downtown from 6:15-7:15 p.m. Forty-plus neighborhood choirs will compete and raise funds for the Pike Market Senior Center and Food Bank. Last year, the Beaconettes won the People’s Choice award for the second year in a row. Here’s a video of them (with very interesting hairstyles) performing “Seattle’s Best Things” for a large crowd at last year’s competition. Come on downtown and cheer them on! You can take Link directly there and back and avoid any Westlake parking hassles. Warm up your wallet for a local gift shopping opportunity! St. George School is hosting the Annual Holiday Bazaar on Sunday, December 4, from 9 a.m. until 3 p.m. in the school’s gathering hall at 5117 13th Ave. S. They promise artists, crafters, and other vendors, as well as food and entertainment for the whole family. Admission is free. Vendors will be there to sell handmade scarves and other knitwear, jewelry, and toys. There will also be representatives of Avon, Mary Kay, Pampered Chef, Tupperware, Theo Chocolate, Choice Teas, and more. Poinsettias donated by Georgetown’s Rosso Gardens will be available. Food available will include a continental breakfast, Ivar’s clam chowder, and pancit.